Although it hasn't been very long since the first edition of Venture Deals was published, the need for information in this evolving field continues to grow. 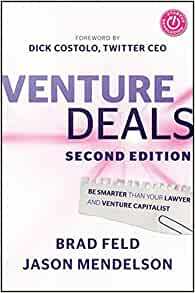 That's why Brad Feld and Jason Mendelson have returned with the Second Edition of Venture Deals. While staying true to the original edition of this Wall Street Journal bestseller, the Second Edition contains timely updatesas well as new material on topics such as convertible debt financingthat will help you excel at this difficult endeavor. Some of today's fastest-growing entrepreneurial companies have financed themselves by raising venture capital. Yet few people have a firm grasp of how venture capital deals really come together. 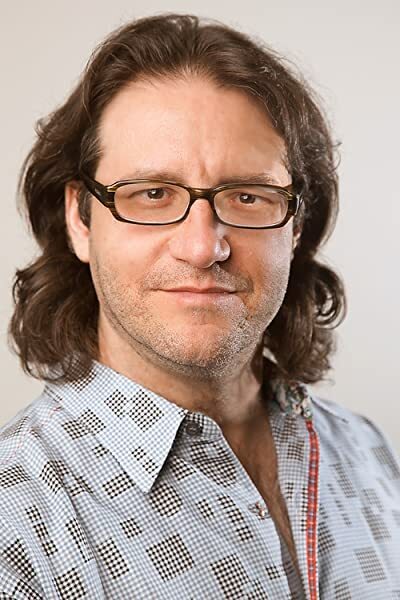 Nobody understands this situation better than Brad Feld and Jason Mendelson. For over twenty years, they've been involved in hundreds of venture capital financings, and now, with this practical guide, they continue to share their experiences in this field with you. Venture Deals, Second Edition opens with an informative overview of the venture capital term sheet and takes the time to discuss the different parties who participate in venture capital transactions as well as how entrepreneurs should go about raising money from a venture capitalist. From here, the book skillfully outlines the essential elements of the venture capital term sheetfrom terms related to economics to those related to control. Feld and Mendelson strive to give a balanced view of the particular terms along with the strategies to getting to a fair deal. In addition to examining the nuts and bolts of the term sheet, this reliable resource also reveals how VC firms operate, describes how to apply different negotiating tactics to your deals, and introduces you to issues you may face at different stages of financing. You'll also gain valuable insights into several common legal issues most startups face and, as a bonus, discover what a typical letter of intent to acquire your company looks like. Whether you're an experienced or aspiring entrepreneur, venture capitalist, or lawyer who partakes in these particular types of deals, you will benefit from the insights found throughout the Second Edition of Venture Deals. For additional information that includes term sheets as well as all of the documents that are generated from the term sheet as part of venturing financing, visit the authors' website www.askthevc.com. "My biggest nightmare is taking advantage of an entrepreneur without even realizing it. It happens because VCs are experts in financings and most entrepreneurs are not. Brad and Jason are out to fix that problem with Venture Deals. This book is long overdue and badly needed." "Feld and Mendelson pack a graduate-level course into this energetic and accessible book. The authors' frank style and incisive insight make this a must-read for high-growth company entrepreneurs, early-stage investors, and graduate students. Start here if you want to understand venture capital deal structure and strategies. I enthusiastically recommend." "A must-read book for entrepreneurs. Brad and Jason demystify the overly complex world of term sheets and M&A, cutting through the legalese and focusing on what really matters. That's a good thing not just for entrepreneurs, but also for venture capitalists, angels, and lawyers. Having an educated entrepreneur on the other side of the table means you spend your time negotiating the important issues and ultimately get to the right deal faster." "Venture Deals is a must-read for any entrepreneur contemplating or currently leading a venture-backed company. Brad and Jason are highly respected investors who shoot straight from the hip and tell it like it is, bringing a level of transparency to a process that is rarely well understood. It's like having a venture capitalist as a best friend who is looking out for your best interests and happy to answer all of your questions." "The adventure of starting and growing a company can be exhilarating or excruciating—or both. Feld and Mendelson have done a masterful job of shedding light on what can either become one of the most helpful or dreadful experiences for entrepreneurs—accepting venture capital into their firm. This book takes the lid off the black box and helps entrepreneurs understand the economics and control provisions of working with a venture partner." 4.0 out of 5 starsfor what it promises it is good... but do you want what it promises? I am a 2x entrepreneur who has raised over $20M in VC funding, so when i say this is a must-read IF you want to raise money I am speaking out of experience. I wish I had this book in 2007, when I was trying to raise money. Terms like "double ratchet anti-dilution", "preferred", "participation", "vesting pool' or "liquidation events" were all terms that I was completely ignorant about. worst yet, our attorneys had to explain these to me, and at $750/hr it was a costly lesson. $30 for this book would have saved me $1,000's in legal fees, and hundreds of thousands in earnings. Well, but now that i have read this book my long-held view about VCs is further perpetuated. VCs are in the business to accomplish two things: (1) preserve their LP capital (i.e. don't lose money). and (2) earn outsized earning to makeup for all the duds (i.e. take everything you can). Note, "make the entrepreneur lots of money" is not on the list. This is something that the authors and most VCs, including Mark Suster on his talks/blogs will confirm this. As an entrepreneur you end up working for the VCs and will get wealthy if your company ends up being one of the 0.01% of VC companies that have very successful exits. If your company does just "great", or "OK" then expect to earn nothing from the exit - while the VC will walkaway with 2x to 5x of the investment. This is not a bad thing if you expect to be in the 0.01%, but as that number indicates - it's not likely. VCs get their money from pension funds, alternative asset funds, government organizations, and basically any large sources of capital that is looking for risk-adjusted better-than-average returns. these are the clients of VCs and these are the folks they are accountable to. So if they don't produce the expected returns, or worse yet lose their capital they won't be in business for too long. (a) push the risk to the entrepreneur and all the "common" investors - do you own "common stock" or "preferred stock"? 'nough said. (b) make the ownership disproportionate to the proceeds of liquidation - meaning, if the ownership is split 50/50 between the founder and the VC then during the sale most of the proceeds (60% to 80%) will go to the VC. this is done by instruments like "preferred class", "full participation", "anti-dilution" and other similar means that create asymmetry in risk/reword. Just read chapters 4 and 5 of the book if you need to see examples. BTW: Does this sound familiar? we had a similar situation in the financial crisis of 2008. Banks created asymmetry in the housing market where they held disproportionate amount of the reword while the risk was pushed out to the homeowner and rest of the economy. Granted, this might not be the fastest way to grow your company and presents the risk of being overtaken by a well-funded company. But if you know that the market is big enough for more then one player (even if you're #2), and you want to keep a larger amount of your hard-earned money and reduce the influence of VCs then think twice about the VC option. But if you think your company is the next Facebook or Google then go for it. However, most founders endup working in "indentured servanthood" to VCs because they end up relinquishing control and ownership of the company while working long hard hours for little pay. Buy this book. Read it. Explore all your capitalization options. Weigh the costs and benefits. But whatever you decide make sure to focus on creating a kick-a$$ products for a kick-a$$ markets more so then about raising money. If you have a great company money will find you. Hope this helps your decision process. This is the second time in my life I find myself doing the rounds to collect proper money from investors. 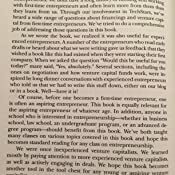 First time, more than fifteen years ago, I used the Bagley and Dauchy classic “Entrepreneur’s Guide to Business Law” and I thought it was pretty good. This book is quite simply in a different league. The authors, seasoned VC entrepreneurs, have a gift for writing and that’s what carries you through the book. It’s all very serious, of course, but the writing style is as far from dry as you can imagine. So I’m reading this and the only thing that keeps me from saying “OK, boys and girls, this covers everything, it’s the gospel” is the simple fact that if I was a VC I’d write a book that makes the case for the VC’s interests rather than the entrepreneur’s. So from where I stand, and I’m an entrepreneur, I’d want an entrepreneur to have written the book. The authors actually go a long way toward addressing this concern: the summary for every section has actually been written by entrepreneur Matt Blumberg and rather often it’s hardly a summary; it emphasizes different point from Brad Feld’s, lending credibility to the book and making the reader more comfortable. • Liquidation Preference arises because VCs come in with preferred stock and means the VC gets its money first. This can be very dilutive if the next round is a down round. • Under “pay to play” provisions, investors who do not participate in the next round get converted to common stock. • Acceleration of vesting upon change of control is a key feature, don’t leave it out! • An automatic conversion clause can be there to force VCs to give up on their preferred ahead of a sale. • If there is an automatic conversion threshold, it must be the same for all classes of stock. • Dividends might be requested by dorky VCs with Private Equity background. • Noncumulative dividends that require board approval are OK. Supermajority even better. • Redemption rights on the preferred (say after 5 years) can be put in by VCs that have the maturity of their fund in mind. • Adverse Change Redemption Rights are evil, because there is no good definition for adverse change. • Conditions Precedent to Financing should be avoided at all costs. • Information Rights are A-OK.
• Registration Rights are A-OK. The world is good if you’re going public. • Right of First Refusal had better be restricted to big investors. • Right of First Refusal had better be pro-rata. • Restriction on Sales is a clause that allows the company itself the right of first refusal. • The Proprietary Information and Inventions Agreement is a clause you actually need. • A Co-Sale Agreement allows investors to sell along with founders. • A No-Shop Agreement had better expire automatically if the sale falls through and should have a carve-out for acquisitions. • A standard Indemnification clause is good corporate hygiene, but it means you need to buy directors’ insurance. • The Assignment clause needs to be read carefully: look for the loophole “assignment without transfer or the obligation under the agreements” which should not be there. • Convertible converts at a discount to the next financing. 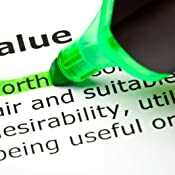 • The purpose is to defer the discussion about the value of the company. • A floor on the value of the stock protects the entrepreneur. • A ceiling protects the investor, but can hurt everybody because it guides (caps!) the next investors on price. • You should put a reasonable time horizon on an equity financing as a condition, or you will find the debt converted before you had time to do the financing. • You should set upfront the minimum amount of financing that triggers the conversion. • The interest rate on the debt should be as low as possible. • There must be clauses regarding the sale of the firm while the debt is outstanding. • Technically, a startup with convertible debt is insolvent!!! • Warrants attached to debt are an alternative to the discount on convertible debt. • Warrants should deliver the most recent class of stock at the most recent round’s price. • Warrants are long-term (e.g. 10 year) call options. • Warrants had better expire at a merger/acquisition unless they are exercised prior to the merger. • Fees received from the LP are higher during the “Commitment Period” during which funds can still be committed to new investments. • Follow-on investments can still be made during the investment term of the fund. • VCs recycle their management fee into the LP if returns during the early life of the fund are good. • If a fund is approaching the end of its life, you don’t want them to invest in you and most probably they can’t anyway. • Ask your VC when they made their last investment. If it was more than 12 months ago, run for the hills. • Get a good result, do not kill your personal relationships and understand the deal you struck. • This deal is not your lawyer’s. • Find out who you are dealing with. • Have a solid Plan B. • Never make an offer first. • Understand what market terms are. • Bear a bad deal, because the acquirer might deliver you from it. • Don’t ask for an NDA. • Don’t carpet bomb VCs. • Don’t be a solo founder. • They will beef up the options plan, right out of the offer they’ve shown you. • An asset deal is crap: you have no assets but must still close the firm down. • If they are offering illiquid stock, that’s something you’ll need to invest the time to evaluate yourself! • You will have to give representations and warranties and if they are qualified by “to the extent currently known” you will have to sign them. • Escrow is the practice whereby part of the offer is put to one side until some conditions have been met. This is a big burden, especially if the consideration is in stock. Fight it as much as possible. • No-shop clauses should expire the moment the buyer terminates the process. • Don’t negotiate your deal at the beginning (that looks awful) but don’t leave it last either. • IP issues can kill a startup before you even really begin. • Non-accredited investors have a right of rescission! 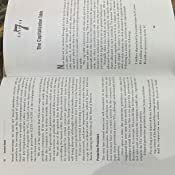 When I picked up Brad and Jason's Venture Deals for the first time, I read through the entire book without setting it down. Having both launched a company and worked in venture capital prior to reading this book, I wish I knew this resource was here when I was first getting started as it would have made for a great backdrop as I went about fundraising, and truly distills the necessary knowledge and motivations in chewable bite sized chunks. Shortly after finishing the book, I had a question about one of the sections and emailed Jason and Brad at 2:30am. Within 6 hours I have a comprehensive response from Jason giving me more insight into the questions I'd raised and why everything isn't always as it seems in an acquisition scenario. Well worth the read for any aspiring entrepreneur or junior venture capitalist who feels out in the deep.